Toddler - $33.99 Small (3T-4T) - $33.99 Only 4 left! Raising children is sure a tough job. Rewarding as it might be, there are all sorts of unexpected struggles that no manual can ever help you with. Heck, their mere creation can be—fun as that might have been, too—just as stressful. So many steps that need to be followed to make sure that everything goes right. Who knew that a species’ propagation was going to be such a chore!? We can turn to several experts to see what they’ve done and attempt to model carefully after their example, fortunately, and no doubt everything will turn out flawlessly. And, if you’re going to find an expert, probably best to find a doctor. They’re smart. Wise from years. Strong devotion to medicine and science, so you know that they’re going to move through all sorts of experiments to find out the proper way to handle a problem and, that way, we don’t have to deal with all of that trial and error. Let’s just pan through our rolodex, here, and find a strong and smart looking doctor name. Dr. Frankenstein. Solid German name, there. Sounds great! Ok. Sooo… admittedly, we probably could have done a little more research on exactly what the good ole’ Dr. meant by helping to raise and animate your kiddo. We might have had a slight miscommunication. 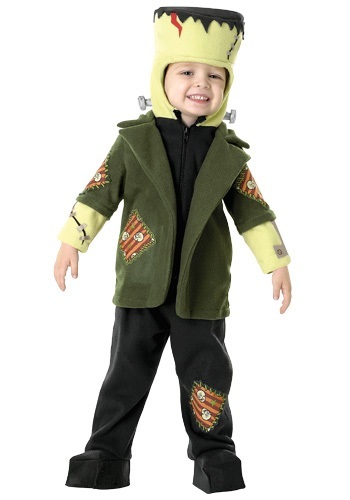 But, heck, that tyke is adorable in this Toddler Frankenstein costume! The gray shirt and green jacket, complete with several bolted patches is a perfect color balance for the light green and barely rotted flesh texture of the hood and stitched arms. (Do take care of the bolts as they are important for any necessary recharging.) Your little monster is sure to be just as sweet and (ab)normal as where we started. Do keep away from fire… but that’s generally good advice no matter the monstrous state of a toddler!